“Many will get this teddy bear at the most critical moment in their lives, our hearts are grateful when we think about the comfort and help we can give through these bears,” emphasized Pál Győrfi, spokesman for the NAS, about the Ambulance Bear project. The HRCA launched its newest joint project with the NAS under the slogan: “a teddy bear for every ambulance,” to brighten the mood of the 45 thousand children who are in need of ambulance care yearly. If someone has ever taken a ride in an ambulance, whether as a patient or a passenger, then they know how stressful the ride to the hospital can be. This is especially true for patients and passengers under the age of 14, and such patients and passengers are also in need of more spiritual support. Understanding this, the Hungarian National Ambulance Service (NAS) and the Hungarian Reformed Church Aid (HRCA) started a special campaign, thanks to which there are teddy bears in every ambulance. The fluffy animals are made to help ease the medical care of children and the trauma caused by falling ill or from an accident. 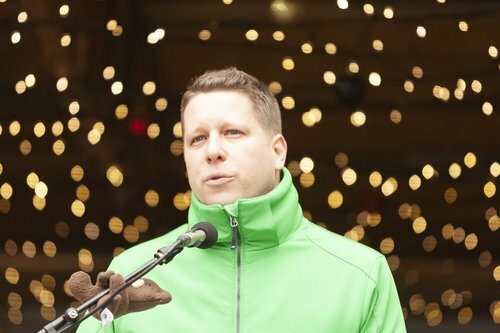 A few years ago, a civil initiative was launched to ease the pain of sick children in ambulance cars by gifting a teddy bear that was no longer being used at home, and then the Neat Szeretek Mindenkit Nonprofit Kft. further developed the idea: they wanted the teddy bears to be sewn by disadvantaged workers out of recycled materials. 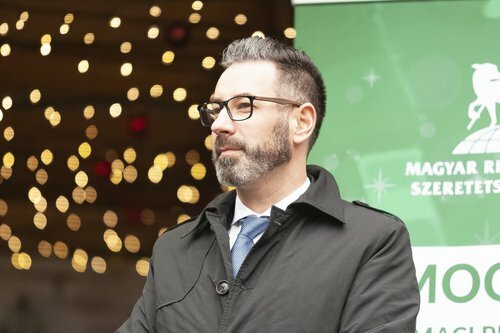 “We have taken up this initiative and sought out the Ambulance Service with the intention of gifting twenty thousand teddy bears in total,” announced Márton Juhász, CEO of the HRCA, at the press conference held at the Christmas market on Vörösmarty Square. He continued, the teddy bears were strictly monitored, so the product gained the CE certificate which guarantees that the toys made for the kids are safe and meet the necessary requirements. The organization gave the first 2000 Ambulance Bears on 11 December which are waiting for the children in the ambulances. 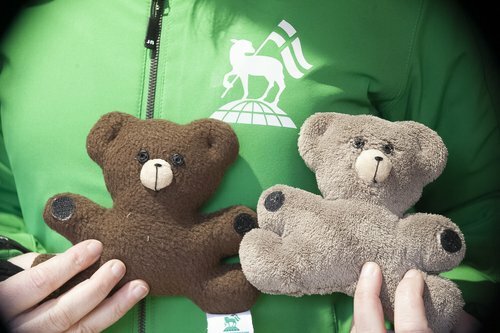 The teddy bears are made at various establishments owned by the Hungarian Reformed Church Aid through the contribution of disadvantaged workers who take part in the rehabilitation employment program that began last year. The manufacturing process of the Ambulance Bears is very complex, it includes cutting, sewing, filling, embroidering, punching, attaching the Velcro, as well as adding a label with the logo of the Reformed Church Aid. “It is better to give than to receive. A person who prepares a gift thinks about the other and believes that what he or she is doing will bring joy to the person who will receive the gift,” added Teodóra Bán, manager of the Budapest Festival and Tourism Center. 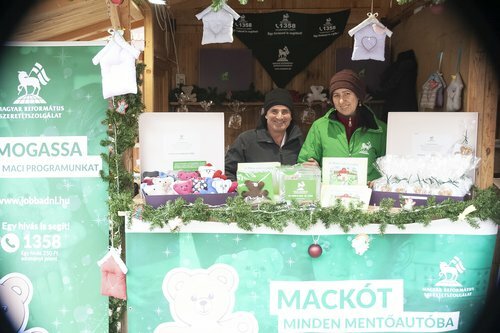 She continued, even though they strictly regulate booths at the Budapest Christmas Market, they are always happy to stand behind an initiative like this in some way, because this is the essence of shared advent celebrations. The teddy bears will be given to sick and injured children in ambulances, as well as those who are accompanying their loved ones to the hospital. The employees of the Reformed Church Aid and the Hungarian National Ambulance Service hope that fewer children will fall ill, however, for those who do end up in an ambulance, the Ambulance Bear will be a true companion. “Many will get this teddy bear at the most critical moment in their lives, our hearts are grateful when we think about the comfort and help we can give through these bears,” emphasized Pál Győrfi, spokesman for the NAS. For the teddy bears to be shared in more ambulances to the children, it is very important that the continuity of production and the conditions necessary for this are ensured. The purchase of one teddy bear contributes the production of another to be gifted.